This is a running list of things I’m actively looking for. This is a a living post and will be updated as needed. If you have any of these items and are looking to part with them, or know where I can obtain them, please contact me. All firearms transactions MUST go through an FFL. These are publicly released pistols that I’m actively looking for. Many are fairly hard to find. I prefer those pistols with original case, including matching case label, and all case contents (loader, brush, rod, lock, correct manual/packet, spent casing, etc.). But I’m willing to discuss any opportunity. Glock 17 Gen 1 w/ pencil barrel, prefer ‘AF’ serial number prefix. This MUST include the matching case with correct label and correct manual. Glock 35C Gen 3 – even though there were only 2 of these made, and they’re both owned by a collector I know, I can always wish, right? Glock 17MB/19MB/21MB – Ambi mag release pistols from Europe. Not sure if the 21MB is the same 21SF pistol with ambi mag release and picatinny rail that was briefly available here. I suspect not. Glock 17 Pro – produced for Finland, with threaded barrel, maritime spring cups, extended slide stop lever, 4.5lb connector, night sights, +2 mag extensions, and redesigned mag release. Glock 19 Tactical. ‘Tactical’ on the right side of these pistols made for the Philippines. Any of the pistols from the ELP program. I already have one of them, but looking for more. See Hand Engraved And Gold Inlaid Factory Glocks for more info. Any of the 30th anniversary pistols. See A Year of Perfection. Detroit PD marked Glock 23. I have a matching G22 and G27 and would like to complete the set. Here are the various non-pistol items that I’m looking for. 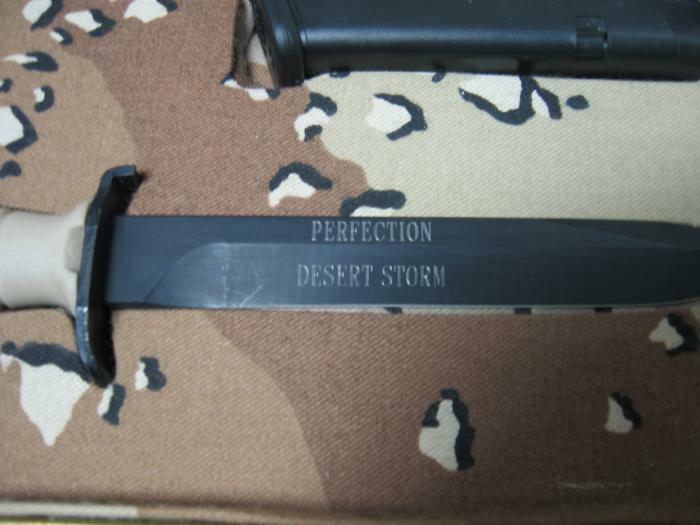 The Glock 78 ‘Perfection Desert Storm’ knife used in some of the Desert Storm display cases. See this photo. Any of the other Glock 78 or 81 knives with the old round Glock logo on the blade and/or sheath except for black 78 & OD 81. See the example on the left in this photo and on the right in this photo. Purple label case – Current gen case with fully intact purple label. Case can be otherwise empty. Orange label case – Current gen case with fully intact orange label. Case can be otherwise empty. Green label case – Current gen case with fully intact green label. Case can be otherwise empty. Orange Glock 17 and 20 training mags. I currently have the orange training mags for the 19, 21, 22, 23. So I’m open to orange training mags in other models not listed here. 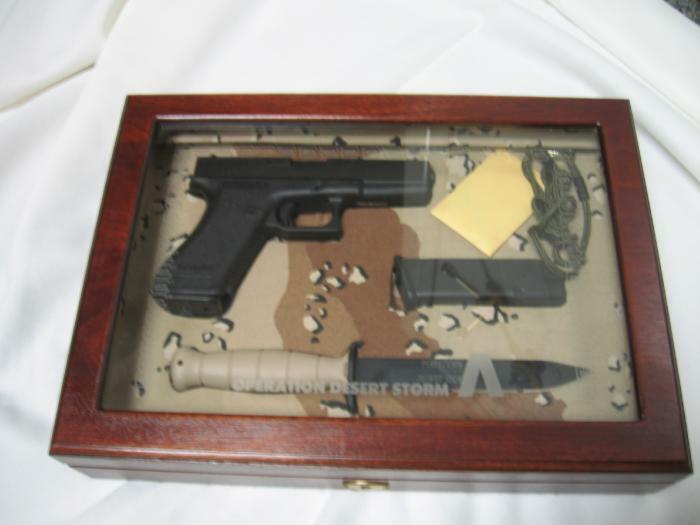 Glock Operation Desert Storm display case and related items. See this picture. I have the pistol and mags. Looking for everything else. Glock mag loaders marked ‘4832’. I need 6 of them. See this picture. Glock staked front sights in excellent condition. I need 4-6 of them. See this picture. Bullet In – this was a magazine sent only to stocking dealers. I’ll take any issues. Glock Annual magazine. I have every issue, so I don’t need any. But I have extras of the following issues to trade/sell.